New. 100% Money Back Guarantee. Brand New, Perfect Condition. We offer expedited shipping to all US locations. Over 3, 000, 000 happy customers. Trade paperback (US). Glued binding. 80 p. Dover Thrift Editions. Fine. 100% Money Back Guarantee. Brand New, Perfect Condition. We offer expedited shipping to all US locations. Over 3, 000, 000 happy customers. Trade paperback (US). Glued binding. 80 p. Dover Thrift Editions. Very Good. 048683185X Minor shelf wear. This book is really inspirational! As an artist, it really helped me see things in myself I never knew were there, and to connect more with my subconcious. If you enjoy this book, also engage yourself in another quick, but wonderful read, "Letters to a Young Artist." It's more current, and set up in the same fashion, just speaks to a the visual crowd. Robert Duncan, the San Francisco poet, praised Rilke to the skies in his graduate seminar Advanced Poetry workshop (English 204) at San Francisco State in the spring of 1965. Following Robert's lead, this book became my daily companion the entire spring. I was working in the UC Berkeley library and would sneak off into a cubicle in the stacks during breaks and lunch hours to devour Letters to a Young Poet. Highly recommended for young (and older!) writers. This book pulled me through during my spells of depression. 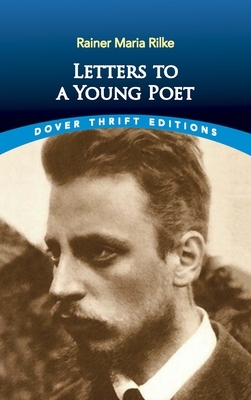 Rilke speaks with utmost warmth and sincerity that is so much akin to a friend. "Things aren't so tangible and sayable as people would usually have us believe; most experiences are unsayable, they happen in a space that no word has ever entered"